Impression Management – Who Does Your Sweatshirt Say You Are? I have a friend who wears a Harvard Law sweatshirt. She didn’t study there. She wanted to, but didn’t. But she doesn’t mind if you think so when you see her wearing the sweatshirt. In fact, that’s pretty much why she wears it. The sweatshirt is actually how I met her. Waiting in line at Starbucks I noticed the just-dying-to-be-noticed sweatshirt. Being a lawyer is my alter ego—the proverbial if-I-hadn’t-done-what-I-did-in-life-I might-have-done-this. And Harvard Law is … well, Harvard Law, the quintessential Holy Grail of legal education. Duly impressed I started up a conversation by asking the obvious question “Oh, did you study law at Harvard?” Mind you, she doesn’t lie when directly asked if she attended the esteemed academy. Faking academic credentials is unethical, illegal and vastly uncool. “Unfortunately not,” she confessed, “I’m a wannabe.” “Me too!” I cooed. And a friendship began. So, about the sweatshirt. It’s not a “just grabbed this old thing out of the pile” decision. Wearing it is as calculated as a celebrity’s overworked “just rolled out of bed” hairstyle. She wants people to see it and assume she is a Harvard Law grad and everything that goes along with that. It’s the impression that she wants people to have of her. And with just a piece of otherwise ordinary clothing she is, for the most part, successful. Now before you start getting judgmental about this little quirk, think for a moment of all the ways in which we do, and have done, the very same thing, just with different props—the designer labels on our clothes, jewelry, cars, sports equipment, etc. We even slap labels on our eyeglasses, makeup, wine and underwear. We walk in designer shoes, write with designer pens, smoke designer cigars. And, to a very great extent, we do it to evoke a certain response from other people. Some will protest that they do it only for themselves. But do you really put on your designer clothes and makeup when you are home alone? Seriously, you know what you look like without makeup and if you really want to know what time it is, a Timex will deliver that information more accurately than its conceited cousin, Rolex. Are you really a different person in your Armani suit than in your sweat pants? Advertisers count on this. They help us formulate the picture we are painting. If it didn’t work they would be out of a job. The heart of psychology is a need to understand why we do what we do—why, for instance, people wear a sweatshirt from an institution with which they have no affiliation. In social psychology the term “impression management” represents one’s attempt, consciously or unconsciously, to influence the way in which others see us and the conclusions about us they draw in response to these perceptions. Through various means individuals attempt to portray themselves to others either as they see themselves or as they wish to be seen. It’s a concept so pervasive, so ingrained into the way we behave on a daily basis, that we often do not even recognize we are doing it or that there is an acceptable alternative. And yet, its enough of a big deal, so to speak, that entire industries are built around maintaining a barely unreachable goal state. If the aim of an advertisement is to sell a product, then a sub-goal on the way to that end is making you believe that product is needed in order to be who you want to be. Particularly in Western individualistic cultures, we are conditioned to believe everything we wear, do, or use is a unique expression of who we are. Industries are so good at perpetuating this concept of ultimate self-presentation that even one’s staunch rejection of the idealized standard becomes in itself a statement of who we are—rebel, non-conformist, free thinker—unbounded by the mandates of others. So strong is this way of thinking that even the converse serves to reinforce the mentality in an exception-proves-the-rule sort of way: If you rebel against the tyranny of designer labels, your protest serves to further ingrain their popularity. Integral to the process of impression management is the psychological concept of the self. Every major philosopher and psychologist has theorized, albeit differently, on how the self imagines itself in relation to others. For Westerners, individual achievement is paramount. For Easterners, contribution as a group member is more important. Others view the self as nothing more than an illusion (see The Self Illusion: How the Social Brain Creates Identity, by Bruce Hood). Every major philosopher and psychologist has theorized, albeit differently, on how the self imagines itself in relation to others. For Westerners, individual achievement is paramount. For Easterners, contribution as a group member is more important. Freud theorized about the competing aspects of the self—the id, ego and superego—while for Jung the self represented one of his most powerful archetypes that symbolized the psyche as a whole. Adler based much of his studies on the universal self-perceived inferiority to others manifesting as a constant struggle for superiority, thus setting up the necessary conditions for what we now label impression management. Any way you slice it, the self is an important psychological concept, and like any important concept psychologists attempt to measure it—all the while still not agreeing on what “it” is exactly. Psychologists Joseph Luft and Harrington Ingram set out to embrace the complexities of the idea of self in their Johari Window model (Johari = Joe + Harry. Such cards we psychologist are!). 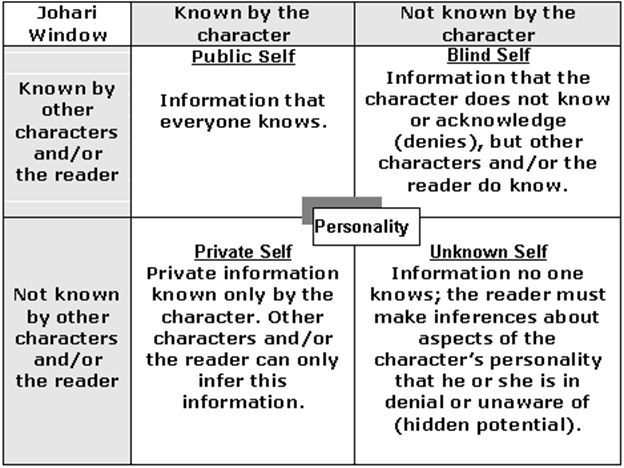 The Johari Window is basically a matrix comprised of the differing views of the self, based on aspects of the individual that are either known or hidden. Each quadrant represents a different combination of the perception of an individual—the Public Self, the Blind Self, the Private Self and the Unknown Self. Joe and Harry went on to theorize different Personas based upon which “self” is the most prominent for the individual. Here’s a link to an online test where you can try out a version of the Johari Window: kevan.org/johari. Yet another way to measure an aspect of impression management is to assess the level to which one engages in self-monitoring behaviors. In 1974, psychologist Mark Snyder developed the Self-Monitoring Scale which differentiates high and low self-monitoring characteristics. In short, high self-monitors will readily and consistently modify their behavior in response to the external situation and/or feedback from others, while low self-monitors will not. You can try a version of this test at personality-testing.info. Conflicting theories and online psych tests aside, humans will forever ponder questions about the self and the selves of others. Who am I? Who are you? Who do you think I am? Who does my sweatshirt say I am?